I can tire of things quickly. Especially decorations around the house. Knowing this about myself, I chose solids for a lot of things - our dinnerware, bedding, table linens, etc. Anything the eye can take in a lot of at once I prefer to have a solid color rather than a pattern. 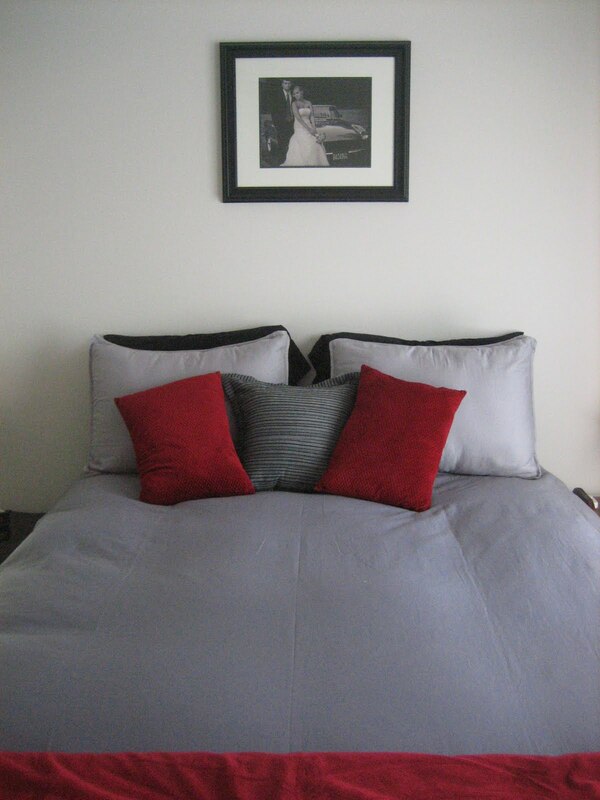 For our bedroom I chose a grey duvet cover (grey has been my new favorite color for a few years now) with red accents. This was so perfect for after we got married-the fall and through the winter. But a few weeks ago I got tired of it. I wanted something brighter and more summer-y, but it's just not practical to buy new bedding. So I decided to store the red away until the fall and be on the look for new yellow pillows! Over Easter weekend, my sister pointed out these amazing yellow pillows, without even knowing I was on the hunt! Of course I snatched them up and I love the change. So, here's my new easy tip for bedding: choose a solid duvet cover or comforter that has different options for accents. Then just buy new pillows and give your bedroom a new look! Thank you for your sweet comment and I love the yellow pillows. Those pillows are stunning and they go so well with the grey. Very chic!